Casement windows are usually mounted on the side-mounted hinges, pivoting closed and open vertically when the internal crank is rotated. Some homeowners don’t find these windows attractive, but for others they use these windows because they offer several advantages. Let us give these windows a fair chance and look at the advantages of these windows. If you are looking for a full open window for your house, this is the best option available in the marketplace. Full open window not only offer excellent outside view but they also allow cross ventilation which helps to cool our residential properties. Casement windows offer great advantages to homes with excellent outside view. 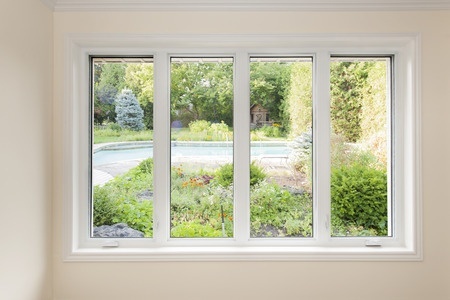 When you install casement windows in your home, you can swing open the entire window. If you install a double hung window, you can open only the upper or the lower half, but never both. This can block the outside view. If you install sliding windows, you can only see one side. The other side of the window is usually fixed. Having a fixed window in your house does not offer many advantages. They don’t allow cool air to enter your home and prevent you from enjoying outside view. So, if the outside view and the size of the window are important to you, you should consider installing casement windows. However, when installing casement windows you must consider fixing an added protection if you have kids at home. Muntins are strips of vinyl, metal, fiberglass, or wood that is used to divide the panes of glass of a window. Some people like muntins, while others don’t. At times, people install fake muntins between two panes of glass to improve the decor of their room. If you are one of those who hate muntins, then casement windows is the ideal option for you. If you install dual-sash casement windows, the only thing that can hinder your outside view is the strip between the two casements. However, if you use a single casement, you won’t have any muntins. At times, your house may be designed in such a manner that the breeze moves along your home in an acute angle. In such a situation, it is difficult to get any breeze with most windows. However, if you install casement windows, the window opening act as funnel allowing cool breeze to enter your home. Casement windows cannot easily be broken. Most households use impact resistant doors and windows for better security and to protect their homes from natural calamities. Homeowners install impact resistant glass on their casement windows because these glasses are extremely strong and cannot be broken easily. Normal storm windows and doors can get easily damaged by strong winds and wind borne debris. Impact doors and windows not only offer extra protection but also improve the value of your home. No wonder, most homeowners looking for door replacements prefer using impact resistant hurricane doors. The investment made on these replacement doors can be easily recovered in a few years.